Have you heard the astonishing true story about the polar bear who made friends with a Husky? You can watch them playing together here. Now we’ve created a show inspired by their unlikely friendship. Join us on a journey into the snow where music, shadows and projection will transport you to a place where polar bears and Huskies really can be friends. Then watch as your child joins in with the adventure and takes their place on Team Polar Bear or Team Husky! The music in Breaking the Ice has been created for the show by Torgeir Vassvik. Torgeir is a Sami vocalist and composer who comes from the northernmost point of the Norwegian mainland, Gamvik in Finnmark. 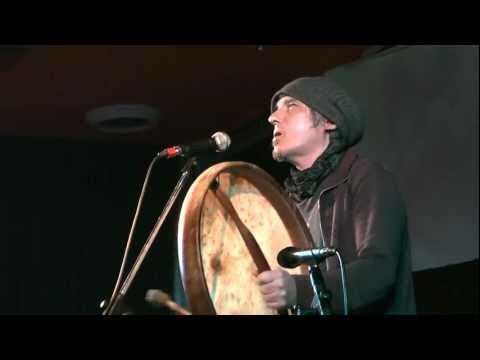 Known for his endlessly inventive blend of ancient Sami folk music, sounds from nature, diverse instruments (including the saw, bells, viola, frame drums and guitars), Vassvik employs the traditional Sami practice of the joik, a form of long, slow, chant-style song formed deep in the throat, intended to act as an aural representation of an individual person, landscape or animal – a sort of portrait in sound. In recent years, Torgeir has brought the sounds of northern Norway to audiences across the world. Watch a clip of Torgeir performing or check out more on his YouTube channel. Catch Breaking the Ice at a venue near you! As there is limited space in the theatre, the price of £15 includes 1 adult with every child place. However, if you would like to book a place for an additional adult we are selling a limited number of adult tickets at £5. These tickets can only be booked by phone by calling our Box Office on 020 7645 0560 and are sold along with a £15 ticket. School & nursery tickets: £10 with every eleventh ticket free. Join us after the performance for play time with music, instruments, hand puppets and lots of singing of much-loved songs! Please bring along a soft toy of your little one's favourite animal. These events are part of UP Club+ and take place after each show. Tickets are £4 per child. Places are limited so book soon to avoid disappointment. The show will be highly visual with little or no language, therefore all performances will be suitable for deaf or hard of hearing audience members. Come and join our party! Torgeir Vassvik is a Sami musician from the Arctic region in Norway, he will be working with the company to create the score.